Bilateral relations between China and Vanuatu have served as a prototype for Pacific island countries, a senior Chinese legislator said. At the invitation of Vanuatu's parliament, a delegation led by Arken Imirbaki, vice chairman of the Standing Committee of China's National People's Congress (NPC) concluded its three-day goodwill visit to the Pacific island country on Sunday. Xinhua News reports during the visit, Arken met with Vanuatu's President Baldwin Lonsdale, Prime Minister Charlot Salwai and Parliament Speaker Esmon Saimon separately. 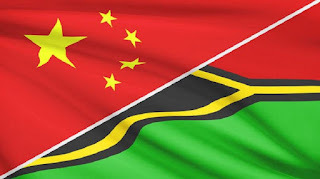 Chinese President Xi Jinping met with Vanuatu leaders in November 2014, when the two sides agreed to establish a strategic partnership featuring mutual respect and common development, the senior Chinese legislator said. Guided by the consensus, relations between China and Vanuatu have seen significant fresh progress, and the ties have become a prototype for Pacific island countries, he added. The year 2017 marks the 35th year of diplomatic relations between China and Vanuatu, and China is willing to take this opportunity to further dialogues, exchanges and cooperation in all fields, as well as boost parliamentary exchanges, in a bid to push forward bilateral ties, said Arken. Vanuatu appreciates China's long-term support to its nation building, the Vanuatu leaders told the senior Chinese legislator, adding that Vanuatu will continue its adherence to the one-China policy, deepen pragmatic cooperation with China, and strive to be China's good friend and partner in the Pacific island region.